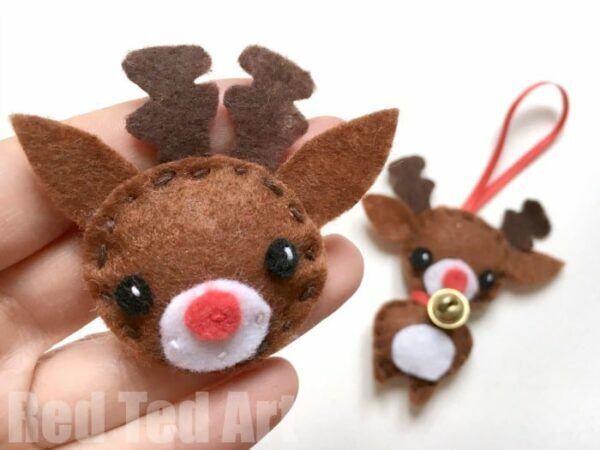 Oh I am SOOOO excited to share these ADORABLE cute Felt Reindeer Ornaments. 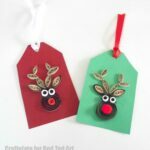 Actually it is a two for one craft.. you can either make a Rudolph Brooch or a reindeer ornament. The brooch is a little easier for kids to manage, the ornament is great for a more experience sewer. It is still easy, but you have to manage “holding” bit in place. 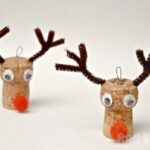 We love DIY Christmas Ornaments and hope you enjoy this one too! 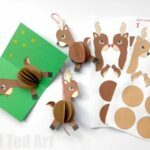 This is a great project to get kids into sewing and we have a fabulous resource of Kids Sewing Projects FOR CHRISTMAS, as well as more general sewing projects for kids for you to browse and check out! 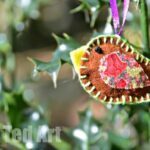 Joining in with the fab Sew a Softie Challenge for Christmas! Find out more over on Colored Buttons! You only need VERY little of the following felt colours…. but it is nice to have them all! I did a simple printable pattern for you too! 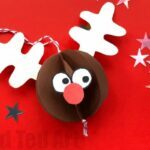 We have a little video for you, which shows how to make the Reindeer as a brooch. The Brooch is a little easier to make if you are working on this with kids! I do rather adore the ornament though. But they are both cute! 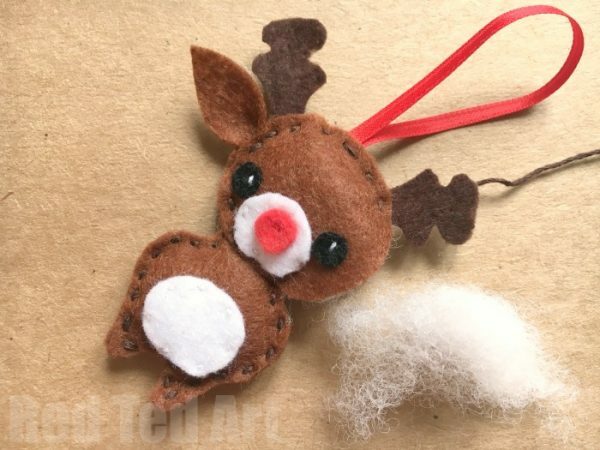 Below the video we have the step by step photos for the Felt Reindeer Ornament! 1. Cut all your pieces out first. Begin by adding the details to both the face and body. 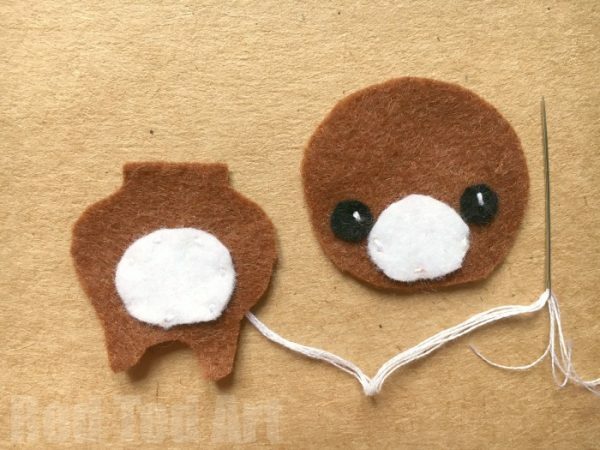 Secure the black felt eyes with one white stitch each. Add the mouth piece with 3 stitches and the body piece with 6 stitches. 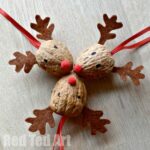 Add the red nose with one simple red stitch. 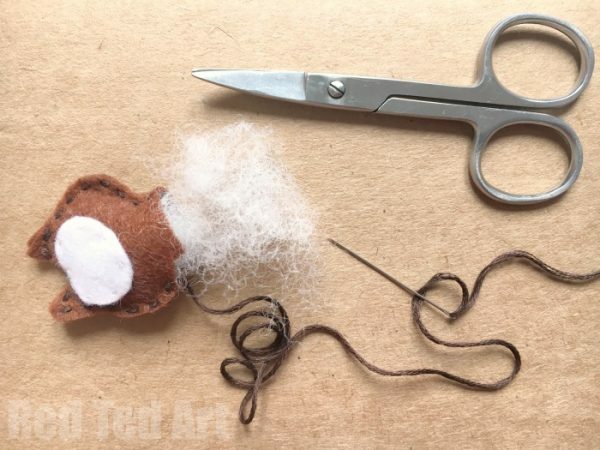 Sew your two body pieces together, leaving the top of your felt reindeer ornament’s body open. Position the head pieces around the body. Add a little stuffing. And sew shut. 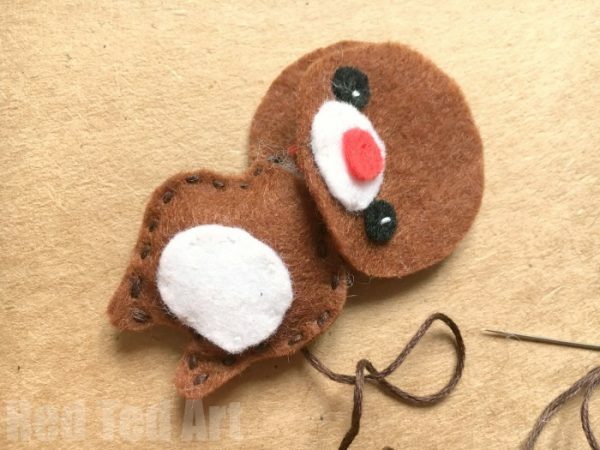 Now add a ribbon and bell and your little Felt Reindeer Ornament is finished! Ta da!! SO SO SOOOOOO cute! 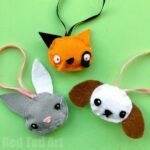 These are so cute and make lovely mini presents too. Thanks for sharing. About how tall will these be? Are they as small as the printable makes them seem? Yes, which is why the printable is small 🙂 such little ornaments.. and if you make the face only you can wear it as a badge.